When annuling a marriage, the Church effectively declares that it never took place. Although expensive to obtain, especially if appealed, an annulment can actually save a man money because, (unless the state compels him to do so), he needn’t pay alimony to a woman who, according to the Church, he never married. 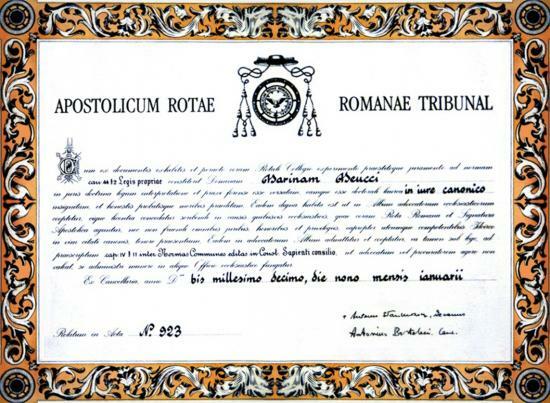 “Apostolic Tribunal of the Rota Romana” is the title of this certificate that the marriage never existed. go to get forgiveness for murder, the priest doesn't try to convince you you didn't kill someone“. This situation is ultimately due to the Vatican's move to gain control over marriage by making it a sacrament. It defined the effects of a sacrament as permanent, but some marriages obviously do not last. The way to reconcile this contradiction was through the annulment of a marriage, proclaiming that it had never really been sealed by a sacrament in the first place. For an annulment the usual reasons why people want a divorce cannot even be considered: infidelity, desertion, physical or psychological abuse, irreconcilable differences or just the fact that two people no longer want anything to do with each other. There are only three kinds of reasons for granting an annulment. The first is a defect in the ceremony. The second involves an impediment to the marriage (for instance, you were too young, were forced into it, or killed someone in order to be free to marry). And, third, a marriage can be nullified if there is a defect in the consent given. This is the case if one of the spouses did not intend to make a lifelong commitment to the other person, or did not intend to have children. However, in practice, a favourite ground for annulment involves canon 1095.3, about "those who are not able to assume the essential obligations of marriage for causes of a psychic nature". It is called the "loose canon", since it can be used to shoot in any direction. Few psychiatric diagnoses are independently verfifiable. An exception is the kind of dementia that is due to low blood levels of Vitamin B12. But there are no lab tests for narcissism or the other conditions which justify an annulment. Everything depends upon statements by the desperate clients and the well-paid psychologists and canon lawyers. For an an annulment under canon 1095.3 one or both partners must psychologically incapable of marriage. This is determined through a very intrusive interview with a psychologist, who sometimes even quizzes the families. Then he shops in the latest edition of the Diagnostic and Statistical Manual of Mental Disorders, which offers him a choice of over 300 kinds of mental disturbance. Personality disorders are the most useful ones for an annulment. They include dependent, histrionic, antisocial, borderline, paranoid, schizoid, schizotypal and obsessive-compulsive (the personality disorder, not the anxiety disorder). 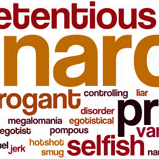 But the favourite is the narcissistic personality disorder, since this allows a spouse to be blamed for a lack of empathy. This hocus pocus can even be used to explain why a supposedly bad marriage lasted so long. The wife had a dependent personality disorder, needed someone to cling to and was oblivious to the needs of her husband. A frank discussion on "streamlining annulments" from the 2014 Synod of the Family which was quickly removed from the web is reposted at the end of this page. But, at the end of the day, it's always a matter of what the market will bear. In Western countries the Catholic Church lays down complicated (and expensive) rules for serial monogamy, but in Africa, wshere it must compete with Islam, it is much more tolerant. La delibazione della sentenza che dichiara la nullità del matrimonio concordatario, qualora non contrasti con altra sentenza emessa dal giudice italiano e sia passata in giudicato, fa venir meno il matrimonio stesso e gli eventuali obblighi ad esso connessi, ad esempio quello di mantenimento, fatti salvi gli effetti verso il coniuge in buona fede. Nessun effetto esplica la dichiarazione di nullità sui figli i quali, se nati in costanza di matrimonio, continueranno a godere dello status di figli legittimi, con tutte le conseguenze giuridiche connesse. "With regard to cohabitation in certain regions, it was shown that this is often due to economic and social factors and not a form of refusal of the teachings of the Church. Often, moreover, these and other types of de facto unions are lived while conserving the wish for a Christian life, and therefore require suitable pastoral care." The opening report for the bishops' synod on the family touched on the process of annulments, noting that reform is being asked by many who often misunderstand the indissolubility of marriage. “With this in mind, it does not seem hazardous to believe that many marriages celebrated in the Church may be invalid,” he said in an Oct. 6 press conference. An annulment, officially called a Decree of Nullity, is the finding by a Church tribunal that on the day spouses exchanged their wedding vows, at least some essential element for a valid marriage was lacking. Essential elements for a valid marriage include, but are not limited to, if one of the spouses did not intend to make a lifelong commitment to the other person, or if one or both of the spouses did not intend to have children. As divorce is not allowed in the Catholic Church due to the indissolubility of the Sacrament of Matrimony, a couple may only obtain permission to separate and re-marry through obtaining an annulment, which declares the marriage invalid from the start due to the lack on one of these essential elements. The so-called “divorce mentality” is often fostered by civil courts or tribunals, Cardinal Erdo observed, who frequently grant divorces to couples without many questions asked. This practice “frequently leads parties to enter into a canonical marriage, while reserving the right to divorce and to contract another wedding should difficulties occur,” he said. “Even without their being fully aware of the ontological and canonical aspects,” this idea renders a marriage invalid, he continued. “This via extra-giudiziale – a solution outside the juridical process – according to them could provide a manner to know, discern and thoroughly examine whether, because of invalidating circumstances, the process could conclude with a declaration of nullity by the diocesan bishop,” the cardinal observed. Under particular fire in the annulment process is the Church’s requirement for having two appeals confirming the declaration of nullity of the marriage bond, the cardinal noted. Beginning in the couple’s diocesan court, the appeal for an annulment currently must be sent to the court of the Apostolic Tribunal of the Roman Rota – the highest appellate tribunal in the Catholic Church, after it has been accepted by the diocese. In the “Rota,” the appeal of the couple currently requires the approval of two judiciaries, who recognize the marital bond as being invalid. One proposal in the renewal of this process calls for only one appeal in the “Rota” rather than two, with the second being required only if “within a defined framework, there is no appeal from either or both (spouses) or from the defender of the bond,” who is the official in the case charged with arguing for the validity of the marriage bond, Cardinal Erdo explained. “A possible solution of this kind should, in any case, avoid any type of mechanics or impression of granting a divorce,” he went on. A commission to study a reform of the process of annulment was established by Pope Francis on Aug. 27. They are currently researching instances when only one appeal is required versus the usual two. Also on the table for discussion regarding marriage are the topics of divorce, remarriage, cohabitation and civil marriages, which are considered to be areas posing particular challenges in terms of pastoral care.